For other uses, see Minas Gerais (disambiguation). Minas Gerais (Portuguese pronunciation: [ˈminɐz ʒeˈɾajs])[a] is a state in the north of Southeastern Brazil. It ranks as the second most populous, the third by gross domestic product (GDP), and the fourth largest by area in the country. The state's capital and largest city, Belo Horizonte, is a major urban and finance center in Latin America, and the sixth largest municipality in Brazil, after the cities of São Paulo, Rio de Janeiro, Salvador, Brasilia and Fortaleza, but its metropolitan area is the third largest in Brazil with just over 5,500,000 inhabitants, after those of São Paulo and Rio de Janeiro. Nine Brazilian presidents were born in Minas Gerais, the most of any state. With an area of 586,528 square kilometres (226,460 sq mi)—larger than Metropolitan France—it is the fourth most extensive state in Brazil. The main producer of coffee and milk in the country, Minas Gerais is known for its heritage of architecture and colonial art in historical cities such as São João del Rei, Congonhas, Ouro Preto, Diamantina, Tiradentes and Mariana. In the south, the tourist points are the hydro mineral spas, such as Caxambu, Lambari, São Lourenço, Poços de Caldas, São Thomé das Letras, Monte Verde and the national parks of Caparaó and Canastra. The landscape of the State is marked by mountains, valleys, and large areas of fertile lands. In the Serra do Cipó, Sete Lagoas, Cordisburgo and Lagoa Santa, the caves and waterfalls are the attractions. Some of Brazil's most famous caverns are located there. In recent years, the state has emerged as one of the largest economic forces of Brazil, exploring its great economic potential. Two interpretations are given for the origin of the name Minas Gerais. It comes from "Minas dos Matos Gerais", the former name of the colonial province ("Mines of the General Woods"). So a first and more common understanding affirms that the name simply means "General Mines", with the word Gerais serving as an adjective to the mines, which were themselves spread in several spots around a larger region. Another explanation is that this ignores the two large geographical spaces which conformed the state in its history: the region of the mines (Minas), and the region of the Gerais ("Matos Gerais" or "Campos Gerais", which means something close to "General Fields"). These corresponded to the areas of Sertão which were farther and hard to access (with an economy based on farming and agriculture) from the mining spots (whose economic space was urban from its origin). The confusion comes from the fact that the term "Gerais" is taken as an adjective to "Minas" in the first version, although according to this point of view it refers to the region called Gerais (as a noun). A further complication is that this is not a well-defined area on the map of the state, but rather a designation to these parts outside the mining spots, more related to the geography of Sertão, and more isolated from the state's nucleus. Minas Gerais is in the north of the southeastern subdivision of Brazil, which also contains the states of São Paulo, Rio de Janeiro and Espírito Santo. It borders on Bahia (north), Goiás (west and northwest), Mato Grosso do Sul (far west), the states of São Paulo and Rio de Janeiro (south) and the state of Espírito Santo (east). It also shares a short boundary with the Distrito Federal (northwest). Minas Gerais is situated between 14°13'58" and 22°54'00" S latitude and between 39°51'32" and 51°02'35" W longitude. It is larger in area than Metropolitan France or Spain. Minas Gerais features some of the longest rivers in Brazil, most notably the São Francisco, the Paraná and to a lesser extent, the Rio Doce. The state also holds many hydroelectric power plants, including Furnas. Some of the highest peaks in Brazil are in the mountain ranges in the southern part of the state, such as Serra da Mantiqueira and Serra do Cervo, that mark the border between Minas and its neighbors São Paulo and Rio de Janeiro. The most notable one is the Pico da Bandeira, the third highest mountain in Brazil at 2890 m, standing on the border with Espírito Santo state. The state also has huge reserves of iron and sizeable reserves of gold and gemstones, including emerald, topaz and aquamarine mines. Emeralds found in this location are comparable to the best Colombia-origin emeralds, and are most often a bluish-green color. Each region of the state has a distinct character, geographically and to a certain extent culturally. The central and eastern area of the state is hilly and rocky, with little vegetation on the mountains. Around Lagoa Santa and Sete Lagoas a typical Karst topography with caves and lakes is found. Some of the mountains are almost entirely iron ore, which led to extensive mining (in some places at the expense of the environment). Recent advances in environmental policy helped to put limits to mining. About 200 kilometres (120 mi) to the east of Belo Horizonte is the second Metropolitan Region of the state, Vale do Aço (steel valley), which has iron and steel processing companies along the course of the Rio Doce and its tributaries. Vale do Aço's largest cities are Ipatinga, Coronel Fabriciano and Timóteo. Now that mining is restricted large areas of forest are being removed for timber, charcoal and to clear land for cattle ranching. The original forest cover of these inland hills is very much fragmented. The city of Governador Valadares is in the limit of this region with the poorer North. The south of Minas Gerais is hilly and green, with coffee and milk production. This region is notably cooler than the rest of the state, and some locations are subject to temperatures just below the freezing point during the winter. The region is also famed for its mineral-water resorts, including the cities of Poços de Caldas, Lambari, São Lourenço and Caxambu. Many industries are located at Varginha and Pouso Alegre. The southeast of the state, called Zona da Mata (Forest Zone) was the richest region until the mid 20th century, nowadays the biggest city, Juiz de Fora, remains an important industrial, cultural and educational center, being also the fourth largest in the Minas state. The day-to-day living in the Zona da Mata however, is better represented by a group of smaller cities like Manhuaçu Além Paraíba, Viçosa, Leopoldina, Cataguases, Muriaé, Ubá, Astolfo Dutra and several others. Those cities put together form a strong economic presence based mostly on agriculture, textiles and minerals. The city of the principal coffee region in Minas Gerais is São João do Manhuaçu situated in Zona da Mata. The west of Minas Gerais, also known as "Triângulo Mineiro" (which means "the Minas Triangle", due to the geographic shape of this region), is composed of a particular type of savanna, known as the Cerrado. This region was initially occupied by large free-wheeling beef ranches, which are still important for the economy of the region. Over the 1990s, extensive soy and corn farms occupied much of the farming land available. The Cerrado is also one of the principal coffee-growing areas of Brazil. The main cities of this region are Uberlândia, Uberaba, Patos de Minas and Araguari. The north of Minas Gerais is part of the arid sertão of the Nordeste, and is thus subject to frequent droughts. Recent irrigation projects use the water from the São Francisco river for agriculture; the river crosses the northern region carrying water from its basin in the central area of the state, which is subject to a regular rainfall pattern. The diamond mines of this region, mainly in Diamantina, attracted miners but are now exhausted, and the remaining population lives in poor conditions, especially in the valley of the Jequitinhonha River. The region is, however, known for its high quality cachaça production. Salinas in particular exports large amounts of this alcoholic beverage. The main cities of this region are Montes Claros, Teófilo Otoni, Pirapora and Janaúba. Serra da Canastra National Park. Flowers in Serra do Cipó. Waterfall in Serra da Canastra. Waterfall in Serra do Cipó. The discovery of the Maxakalisaurus topai (Dinoprata) fossils was a significant paleontological find. The fossil is a genus of titanosaurid dinosaur found 45 kilometers (28 mi) from the city of Prata (Triângulo Mineiro), in the state of Minas Gerais in 1998. It was closely related to Saltasaurus, a sauropod considered unusual because it had evolved apparently defensive traits, including bony plates on its skin and vertical plates along its spine; such osteoderms have also been found for Maxakalisaurus. The genus name is derived from the tribe of the Maxakali. The Maxakalisaurus fossils belonged to an animal about 13 meters (43.3 ft) long, with an estimated weight of 9 tons, although, according to paleontologist Alexander Kellner, it could reach a length of approximately 20 meters (65 ft). It had a long neck and tail, ridged teeth (unusual among sauropods) and lived about 80 million years ago. Because sauropods seem to have lacked significant competition in South America, they evolved there with greater diversity and more unusual traits than elsewhere in the world. A replica has been displayed at the Museu Nacional in Rio de Janeiro, since August 28, 2006. In the colonial era, the Brazilian interior was colonized by Portuguese and bandeirantes. The Brazilian gold rush ushered in an influx of new settlers in search of veins of gold (discovered 1693) and gems, and later diamonds which come from the naturally occurring itacolumite rock that can be found in great numbers in the region. These helped to boost occupation of the inner lands and led to the foundation of several new villages. 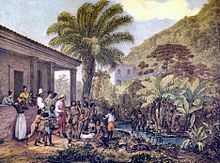 In 1697, the Portuguese used enslaved African labor to start building the Estrada Real, the "royal road," that would connect the ports of cities of Rio de Janeiro and Paraty to the mineral-rich regions of Ouro Preto, Serro, and, at the northernmost point, Diamantina. Prior to 1720, Minas Gerais was part of the captaincy of São Vicente (later renamed São Paulo e Minas de Ouro). The first capital of Minas Gerais, and seat of the local see, was the city of Mariana; it was later moved to Vila Rica. In the late 18th century, Vila Rica was the largest city in Brazil and one of the most populous in America. As the gold mines were exhausted over the 19th century, the city lost its importance; it was later renamed Ouro Preto and remained the state capital until the construction of the all-new, planned city of Belo Horizonte at the turn of the 20th century. The gold cycle left its mark in cities such as Mariana, Ouro Preto, Diamantina, Sabará, Tiradentes and São João del Rei. The relative isolation from European influence, added to the huge influx of gold and other valuable minerals, helped the local people to develop their own style of art, which became known as Barroco Mineiro. Prime examples of this period are the richly decorated churches in the colonial cities. The most important artist of this period was Antônio Francisco Lisboa, who became known as Aleijadinho. His sculptural and architectural work, as exhibited in the Twelve Prophets and The Church of Saint Francis of Assisi in Ouro Preto, are highly valued by experts as one of the most refined artistic expressions outside Europe at that time. In addition to art and architecture, there was an explosion of musical activity in Minas Gerais in the 18th century. Printed copies of European music, as well as accomplished musicians, made the journey to the area, and soon a local school of composition and performance was born and achieved considerable sophistication. Several composers worked in Minas Gerais in the 18th century, mainly in Vila Rica (now Ouro Preto), Sabará, Mariana, and other cities. Some of the names which have survived include José Joaquim Emerico Lobo de Mesquita, Marcos Coelho Netto, Francisco Gomes da Rocha and Ignácio Parreiras Neves; they cultivated a style related to the classical European style but marked by more a more chordal, homophonic sound, and they usually wrote for mixed groups of voices and instruments. Guimarães Rosa's literature is mostly situated in Minas Gerais, with locations widely located across the State (hence the term General, although more concentrated in its north) rather than delimited and identifiable. This northern area began to be colonized (with brutal conflicts with the large Amerindian population who lived in some parts, especially in Vale do Jequitinhonha) and became accessible to colonists departing from Bahia up north, which made the Portuguese crown insert the region within the state of Minas Gerais's borders in order to prevent gold and diamond smuggling from people trying to avoid colonial taxation and oversight; thus the state of MG was closely watched by the crown because of its tax revenue. During the 18th century, mining exploration was strongly controlled by the Portuguese Crown, which imposed heavy taxes on everything extracted (one fifth of all gold would go to the Crown). Several rebellions were attempted by the colonists, always facing strong reaction by the imperial crown. One of the most important was the Felipe dos Santos revolt that ended with his execution but also with the separation of Minas Gerais of São Paulo. The most notable one, however, was the Inconfidência, started in 1789 by group of middle-class colonists, mostly intellectuals and young officers. They were inspired by the American and French Enlightenment ideals. The conspiracy failed and the rebels were arrested and exiled. The most famous of them, Joaquim José da Silva Xavier (known as Tiradentes), was hanged by order of Queen Maria I of Portugal, becoming a local hero and a national martyr of Brazil. The Minas Gerais flag—a red triangle on a white background, along with the Latin motto "Libertas quæ sera tamen", "freedom albeit late"—is based on the design for the national flag proposed by the "Inconfidentes", as the rebels became known. In the economic history of Brazil, Minas Gerais plays a pivotal role in shifting the economic axis from the Brazilian northeast (based on sugarcane, that starts declining in the 18th century) to the southeast of the country, which still remains the major economic center. The large amounts of gold found in the region attracted the attention of Portugal back to Brazil, progressively turning Rio de Janeiro into an important port city, from where these would be shipped to Portugal and where the Portuguese crown would eventually move its administration in 1808 after Napoleon Bonaparte's invasion of Portugal (see Transfer of the Portuguese Court to Brazil). Due to the economic importance of the state and the particular traits of the local population—famed for its reserved and balanced character—Minas Gerais has also played an important role on national politics. During the 19th century, politicians such as José Bonifácio de Andrada e Silva were instrumental in the establishment of the Brazilian Empire under the rule of Dom Pedro I and later his son, Dom Pedro II. After the installation of the Brazilian Republic, during the early 20th century, Minas Gerais shared the control of the national political scene with São Paulo in what became known as the "Coffee with Milk" (café com leite) political cycle (coffee being the major product of São Paulo, and milk representing Minas Gerais' dairy industry, despite the latter also being an important coffee producer). Minas Gerais was also home to two of the most influential Brazilian politicians of the second half of the 20th century. Juscelino Kubitschek was president from 1956 to 1961, and he was responsible for the construction of Brasília as the new capital of Brazil. Tancredo Neves had an extensive political career that culminated with his election in 1984 to be the first civil president after the 1964 military countercoup. However, he died after a series of health complications just as he was about to assume the position. Also, Itamar, Brazil's previous president, lived there, though he was not born in Minas. See also the List of Governors of Minas Gerais. Ouro Preto and its colonial Portuguese architecture. According to the IBGE of 2008, there were 19,765,000 people residing in the state. The population density was 32.73 inhabitants per square kilometre (84.8/sq mi). Urbanization: 85% (2006); Population growth: 1.4% (1991–2000); Houses: 5,741,000 (2006). The last PNAD (National Research for Sample of Domiciles) census revealed the following numbers: 9,091,000 White people (46%), 8,927,000 Brown (Multiracial) people (45%), 1,802,000 Black people (9%), 40,000 Asian people (0.2%), 37,000 Amerindian people (0.2%). Ethnic groups found in Minas Gerais include: Amerindians, Portuguese, Africans, Italians, Germans and Lebanese. The ethnic composition of the population varies from town to town. For example, in Córrego do Bom Jesus, a small town located in the extreme south of Minas Gerais, White people make up 98.7% of the population. The South of Minas Gerais is both the most European and the most densely populated part of the state. On the other hand, in Setubinha, located in the northeast part of the state, 71.8% are mixed-race and 14.7% Blacks. It is historically explainable: southern Minas Gerais, in the border with São Paulo, received larger numbers of Portuguese farmers in colonial times. In the late 19th century, Italian immigrants also arrived. The north region, close to Bahia, was a place to the arrival of many African slaves since the 18th century. The central part of the state, where the capital Belo Horizonte is, has a more balanced ratio between Whites, Blacks and mixed people. Downtown of Uberlândia, largest city in the state after Belo Horizonte. The population of Minas Gerais is the result of an intense mixture of peoples, particularly between Black Africans and Portuguese. In colonial Minas Gerais, the population was divided in five different categories: Whites, mostly Portuguese; Africans, who often did not have a surname and were usually known for their region of origin (for example Francisca Benguela would refer to Benguela); Crioulos (Black people born in Brazil, usually to both African parents); Mulattoes (people of mixed Black and White ancestry, usually born to a Black mother and a Portuguese father) and Cabras (people of mixed ancestry, usually with high degree of Amerindian admixture). Blacks and Mulattoes predominated in the population after the beginning of the colonization. By the 19th century, however, whites were already the largest single group in the Minas Gerais population. Taking the population as a whole (all groups included), European genes account for the majority of the Minas Gerais genetic heritage, which has been explained on the basis of the extremely high mortality rates of the enslaved African population and lower reproductive rate of African slaves (the vast majority of them were males, among other reasons for their lower reproductive success). The Amerindian population was hit hard by the diseases brought by the European colonists and they did not have much of an impact either, especially in Minas Gerais, where European presence and colonization was massive. During the colonial period, the disproportion between the number of men and women was quite sharp. The census of 1738 in Serro do Frio, which included Diamantina, revealed that of the 9,681 inhabitants, 83.5% were men and 16.5% women. Among the slaves, women were only 3.1%. The number of free "women of color" (Blacks and Mulattoes) was very high. The same census revealed that 63% of the former slaves were women and only 37% men. Since interracial relationships between "women of color" and White men were widespread, the female slaves were more likely to be freed than the male slaves. The monogamous family structure that the Catholic Church tried to deploy in colonial Brazil was the exception in Minas Gerais. At that time cohabitation and temporary relationships predominated in Minas Gerais, as well as in Brazil as a whole. Monogamy and weddings in churches would only take root in Brazil in the 19th century, fitting the moral standards imposed by the Church. The role of women in colonial Minas Gerais was much more dynamic than it would be allowed by the standards of the time. Many women used to live on their own, were heads of family and worked, particularly the "women of color" and former slaves. The society of Minas Gerais provided a great social mobility to former slaves, mainly for women. In Tejuco, the percentage of White males who were head of family (37.7%) was very similar to the percentage of Black women who were head of family (38.5%). Many former slaves were able to accumulate goods and many of them became slave owners as well. Some Blacks and mainly Mulattos were able to integrate themselves in the highest social stratum of the society of Minas Gerais, once restricted to Whites. This happened through a process of "whitening" their descendence and through the assimilation of the culture of the White elite, like being members of Catholic brotherhoods. Cohabitation was the most common crime in Minas Gerais. The Catholic Church was strict in the punishment of this crime, in order to prevent the widespread miscegenation between White, mostly Portuguese males with Black or Mulatto women. According to a 2013 autosomal DNA study, the ancestral composition of the state of Minas Gerais can be described as: 59,20% European, 28,90% African and 11,90% Native American  A genetic study (with a few samples and not covering the most populated part of the state, the South of Minas Gerais), suggested that the "Whites" from Minas Gerais would have slightly lower levels of European (at 71%) ancestry among the Brazilian regions and higher levels (at 16%) of African admixture, with significant Amerindian (13%) admixture, the European reference population in the study being 95% European, 2.8% Native American and 2.6% African, which would give an actual percentage of European ancestry of about 75% actual European ancestry, and less than 15% of each, Native American and African ancestries. According to another study, however, the European ancestry is dominant throughout Brazil at about 77%, Minas Gerais included (and this taking into account the whole of the population of Minas Gerais, "white", "pardos" and "blacks"). "A new portrayal of each ethnicity contribution to the DNA of Brazilians, obtained with samples from the five regions of the country, has indicated that, on average, European ancestors are responsible for nearly 80% of the genetic heritage of the population. The variation between the regions is small, with the possible exception of the South, where the European contribution reaches nearly 90%. The results, published by the scientific magazine American Journal of Human Biology by a team of the Catholic University of Brasília, show that, in Brazil, physical indicators such as skin colour, colour of the eyes and colour of the hair have little to do with the genetic ancestry of each person, which has been shown in previous studies". During the time of the gold rush, the largest European immigration of the colonial period to all of the Americas, about 600,000 Portuguese immigrated to Brazil during the gold rush, and most of them to Minas Gerais, the place where the gold rush activities took place. Most of them came from Entre Douro e Minho, in Northern Portugal. The reference book for a large number of these families is "Velhos Troncos Mineiros" (Old Mineiro Branches) by Raimundo Trindade. The Native American population of Minas Gerais was estimated to be at 97,000 in 1500, by the time the Portuguese arrived in Brazil in 1500 (John Hemming in "Red Gold: The Conquest of the Brazilian Indians"). 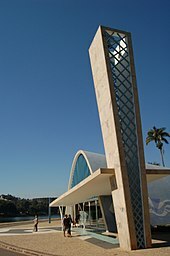 Oscar Niemeyer's Church of São Francisco de Assis, in Pampulha. This satellite photograph illustrates the diverse agricultural landscape in the western part of Minas Gerais. The service sector is the largest component of GDP at 47.1%, followed by the industrial sector at 44.1%. agriculture represents 8.8% of GDP (2004). Main exports: mineral products 44.4%, metals 15.8%, vegetable products 13%, precious metals 5.5%, foodstuffs 4.9%, transportation 3.5% (2012). Share of the Brazilian economy: 9% (2005). Minas Gerais (or simply Minas, as it is commonly called) is a major producer of milk, coffee and other agricultural commodities, as well as minerals. Electronics are also produced in Minas. The automakers Fiat and Mercedes-Benz have factories there. Tourism is also an important activity for the state: historical cities like Ouro Preto, Mariana, Sabará, Congonhas, Diamantina, Tiradentes, and Sao João del Rey, are major attractions for visitors interested in their colonial architecture. Other cities, like Araxá, Poços de Caldas, Lambari, Caxambu, Lavras, and others, attract visitors interested in their mineral watersprings. Eco-tourism is a rising economic activity in the state, specially in localities situated on the several Serras (highlands) that exist in Minas Gerais. The state has marked economic divisions. The southern part of the state (close to the São Paulo and Rio de Janeiro state borders) has several mid-sized cities with solid industrial bases such as Juiz de Fora, Varginha, Pouso Alegre, and Poços de Caldas, as well as Ipatinga in the east of the state, which is also a modern and major industrial city and Itabira, considered mother city of mining company Vale, that has stocks quoted in Bovespa and NYSE. The northeastern region is marked by poverty, but Governador Valadares and Teófilo Otoni attract foreign traders for the semi-precious gems such as topaz and sapphire. The central region of the state (where the capital is located) has big reserves of iron (and to a lesser extent, gold) still being actively mined. There are also large companies installed the automotive industry, as manufacturers FIAT in Betim, IVECO in Sete Lagoas and suppliers of auto-parts, as STOLA and USIPARTS. The western part, the "Triângulo Mineiro", is less densely populated than the rest of the state, and it is now a focus of biotechnology investment, particularly on the cities of Uberlândia, Uberaba, Patos de Minas and Araguari, which includes leading research on cattle, soy and corn culture. As of April 2007, there are 11.3 million mobile phones and 4.2 million telephones in the country. Minas Gerais (MG) cities area phone codes (called DDD in Brazil) are from 31 to 38. Minas Gerais is home to some of the best schools in the country, both at the secondary and higher levels. It is also the state that contains the largest number of Federal Universities, public universities maintained directly by the federal government. Minas Gerais may be called Deep Brazil by analogy with France profonde. It has a distinctly more native flavour than cosmopolitan São Paulo, a more traditional slant than flashy Rio de Janeiro, and is more Portuguese than the South and São Paulo with their great influx of Italians and other Central Europeans, the North with its Native Americans, or the Northeast with its heavy Afro-Brazilian influence. Those born and raised in Minas Gerais, also called Mineiros, bear an unmistakable accent that sets them apart from fellow Brazilians, although people born in different regions of the state bear slightly different accents, some resembling those of neighboring states, such as São Paulo, Rio de Janeiro and Bahia. One prominent example is Larissa from TLC's hit 90 Day Fiance show. They are considered reserved, prudent, relatively silent to the point of melancholy but welcoming and family-focused. It is one of the most religious states, with a large proportion of staunch Roman Catholics and a burgeoning Evangelical and neo-Pentecostal population, with pockets of African religions. The Spiritist doctrine is also professed by a significant portion of the population, partly due to the influence of Chico Xavier, the main spiritual icon of Brazil, who lived in Minas Gerais all his life. Minas Gerais is known nationally for its cuisine. The cultural basis of its cuisine is the small farmhouse, and many of the dishes are prepared using locally produced vegetables and meats, especially chicken and pork. Traditional cooking is done using coal- or wood-fired ovens and cast iron pans, making for a particularly tasty flavor; some restaurant chains have adopted these techniques and made this type of food popular in other parts of the country. Many of the cakes and appetizers of the local cuisine use corn or cassava (known there as mandioca) flour instead of wheat, as the latter did not adapt well to the local weather. The best-known dish from Minas Gerais is "pão de queijo", a small baked roll (known internationally as "Brazilian cheese rolls") made with cheese and cassava flour that can be served hot as an appetizer or for breakfast. The state is also Brazil's most traditional producer of cheese. Minas cheese is renowned nationwide as the distinct Brazilian cheese. Cachaça is also a local produce of some importance. The state cuisine is showcased in various festivals year round and in many locations throughout the state, but the biggest festival is the month-long Comida de Buteco in Belo Horizonte, where 41 bars and restaurants are selected to create a dish using ingredients traditional to local cuisine. People from all over the country and abroad rate the food, the temperature of the beer, the ambiance and service. In 2007, over 400,000 people participated in the festival according to Vox Populi statistics. Mariano Procópio Museum, in Juiz de Fora, and Centro de Arte Contemporânea Inhotim, in Brumadinho, are among the most important cultural institutions. Music is one of the most striking features of Minas Gerais and has been part of the history of the state since the early 16th and 17th centuries. From the 18th century, composers including Jose Joaquim Lobo de Mesquita, Francisco Gomes da Rocha, Marcos Coelho Neto and Manoel de Oliveira Dias reinforced the musical tradition of Minas with the composition of baroque pieces that are now revered as masterpieces. For classical music, the state features productions and performances of various orchestras and choirs. Among them there are the Symphonic Orchestra of Minas Gerais and the Coral Lírico de Minas Gerais, a State Choir, maintained by Clovis Salgado Foundation, an institution linked to the Secretary of State for Culture. These and other groups have a strong presence in the capital and throughout the state, working for the popularization and democratization of classical music. One of the most prolific contemporary composers was born in Minas Gerais, Prof. Dr. Andersen Viana, which music has been recognized most frequently abroad. The most varied rhythms and sounds have their origins in the state. Ary Barroso, who in 1939 composed one of Brazil's best known songs throughout the world, Aquarela do Brasil, was born in Ubá, in the Zona da Mata Mineira. In the 1960s and 70s streets in the traditional neighborhood of Santa Tereza, Belo Horizonte, were the scene of one of the most important movements of national music: Clube da Esquina. With a unique blend of Brazilian popular music with pop and jazz, the Club was met with talents like Milton Nascimento, Wagner Tiso, Toninho Horta, Fernando Brant, Lô Borges, Beto Guedes, and Flávio Venturini. In the 1980s and 90s a scene of Heavy Metal bands has been held in Belo Horizonte. It's the origin of important Brazilian bands of this genre, many of them are known worldwide, such as Sepultura, Sarcófago, Overdose, Mutilator, Holocausto and Chakal. The current scenario continues reflecting the vibrancy and dynamism of its culture. A new generation of artists is represented by names like Skank, Pato Fu, Jota Quest, Vander Lee, Uakti, Marina Machado, Maurício Tizumba, Berimbrown, Copo Lagoinha and Amaranto. Moving freely through different rhythms like rock, reggae, heavy metal, samba and MPB, among others, the music in Minas Gerais continues the excellence and diversity that has always been a staple in the country. The important International Festival of Colonial Brazilian Music and Ancient Music takes place in Juiz de Fora since 1989. Brazil's most prestigious dance company, Grupo Corpo is also from Minas Gerais, having its headquarters in Belo Horizonte. Many famous Brazilian writers were born in Minas Gerais: Carlos Drummond de Andrade, Fernando Sabino, Pedro Nava, Murilo Mendes and João Guimarães Rosa. Aviation pioneer Alberto Santos-Dumont was born in Minas Gerais, as well as various politicians, such as Presidents Afonso Pena, Venceslau Brás, Delfim Moreira, Artur Bernardes, Juscelino Kubitschek, Tancredo Neves and Dilma Rousseff. Former president Itamar Franco is usually included in lists of presidents born in Juiz de Fora, Minas Gerais, but he was actually born prematurely in a ship travelling in the Atlantic Ocean. Minas Gerais is often recognized abroad as the state where the footballer Pelé was born (he has lived in the state of São Paulo since childhood, though). Tancredo Neves International Airport is located in the municipalities of Lagoa Santa and Confins, 38 km (23 mi) from Belo Horizonte, and was opened in January 1984. It was planned from the start for future expansion in steps to meet growing demand. The airport has one of the lowest rates of shutdown for bad weather in the country. However, the Confins airport was not using much of its capacity until 2005, when it was decided that a large part of the Pampulha Airport flights (which is smaller and located inside Belo Horizonte's urban area) would move to Confins. The first step was undertaken with careful concern for the environment, including monitoring by specialized consultants, since the region has a rich archeological heritage. Among the hundreds of caverns in the region, the one at Lapa Vermelha stands out. Located 2.7 km (1.6 mi) from the airport, the oldest female cranium in the Americans was discovered there, dated at roughly 12 thousand years old. Confins is certified by the ISO 9001 standard, covering ten processes in the administrative, operational, safety/security and maintenance areas. The Tancredo Neves International Airport is currently the fifth busiest airport in the country, after Guarulhos, Congonhas, Brasília and Galeão. It is a main hub for Azul. In addition to direct flights to over 40 destinations in Brazil, it also has regular scheduled international services to Buenos Aires, Panama City, Miami and Lisbon. In 2014 the airport was auctioned to the private sector. Renovations were concluded in 2016. A new terminal was built with 17 new jetways, increasing the airport's capacity to 22 million passengers a year and the runway is undergoing expansion. A new runway is planned to be built by 2020. A new Administrative Center was completed in March 2010, for the state of Minas Gerais. Designed by the internationally renowned architect Oscar Niemeyer, the center consists of four large buildings on an 800,000 square meter site. Two buildings accommodate 17 of the state ministries, the third building consists of an auditorium, with capacity for 540 guests. The fourth and most impressive building is the "Palacio do Governo", which is the world's largest suspended structure, built in reinforced concrete. The building has a 150m span and its roof is supported by 4 columns. Minas Gerais is the Brazilian state that harbors the highest mileage of highways. The state highway network is 269,545 kilometers, of which only 11,396 on federal roads and 21,472 on state highways and state coincide, corresponding to all other municipal roads. Because of its central position, the state is crossed by the most important national highways, like BR-116 (Rio-Bahia), BR-040 (Rio-Brasília) and others. Many of the most important Brazilian routes cross the state and, for this reason, it counts the greater proportion of car accidents per capita. BR-122, BR-040, BR-135, BR-146, BR-251, BR-259, BR-265, BR-265, BR-265, BR-265, BR-267, BR-352, BR-354, BR-356, BR-356, BR-364, BR-367, BR-367, BR-367, BR-381, BR-381, BR-383, BR-383, BR-393, BR-459, BR-462, BR-464, BR-491. As in the rest of Brazil, football is the most popular sport among locals. Pelé, widely considered the best footballer of all time, was born in the Minas city of Três Corações. Belo Horizonte is home to two of the most successful teams in the country, and the city also has one of the biggest football stadiums in the world, the Mineirão, opened in 1965. Reopened after renovations in 2013, Mineirão was chosen as one of the venues for the 2014 FIFA World Cup, and also the soccer tournament of the 2016 Summer Olympics. Another stadium in Belo Horizonte, Independência Stadium, was one of the venues of the 1950 FIFA World Cup, where it hosted a legendary upset of the United States team over England. The biggest teams of Belo Horizonte and Minas as a whole are Atlético Mineiro, founded in 1908 and nicknamed "Galo" (rooster) after its mascot, and Cruzeiro, founded in 1921 as "Palestra Itália" by the members of the local Italian community - but renamed in the 1940s as the government of Getúlio Vargas forbid mentions of the Axis powers. Atlético won one edition of the Campeonato Brasileiro Série A in 1971, two CONMEBOL Cups (the predecessor of the current Copa Sudamericana), is the biggest winner of the State Championship with 41 titles, one title of the Libertadores Cup Champion in 2013 and one Copa do Brasil title in 2014. Cruzeiro won 36 state championships, won four times the Brazilian Championship, defeating Pelé's Santos in the 1966 Taça Brasil, the 2003 Campeonato Brasileiro Série A (which combined with a state championship and a Brazilian Cup in the same year lead to a treble named by Cruzeiro as "Triple Crown"), won the 2013 and 2014 national league. Cruzeiro has been one of Brazil's most successful clubs since the 1960s, being elected the most successful Brazilian team of the 20th century by IFFHS. Its titles include 4 editions of the Brazilian Cup, 4 Brazilian Championships and 2 Copa Libertadores in 1976 and 1997. Cruzeiro is one of the only five clubs to have never been relegated in the National League, while Atlético missed the 2006 edition, following a relegation in the previous year (2005). Belo Horizonte is also home to América Mineiro, founded in 1912 current owner of Independência and considered the third force of the state. While the team's struggles combined with the popularization of Atlético and Cruzeiro reduced América's supporters, the team has won both the second and third levels of the Brazilian Championship, the Sul-Minas Cup in 2000, and 16 state championships, including a record dynasty of ten tournaments between 1916 and 1925. Both Villa Nova of Nova Lima and Betim Esporte Clube (when it was known as Ipatinga Futebol Clube) have won the state championship and been in Série A of the Brazilian league. Besides football, Belo Horizonte has one of the largest attendances at volleyball matches in the whole country. Multisport club Minas Tênis Clube had its male and female teams win the Brazilian Superleague of Volleyball, with Contagem-based Sada Cruzeiro also winning the male tournament. Sada-Cruzeiro also won the FIVB World Club Championship two times in last 3 years, being one of the most successful volleyball team in the world. The Brazil national volleyball team has had some of its highest attendance numbers at Mineirinho, an arena located near the Mineirão stadium. On basketball, both Minas and Uberlândia's Uberlândia Tênis Clube are in the national tournament. The flag's Latin inscription, "Libertas quæ sera tamen", means "Freedom albeit late", and was the motto of the Inconfidência Mineira, which fought for Minas' independence from Portugal in the 18th century. The phrase was taken from Virgil's Eclogues 1.30. The triangle is said to represent the Holy Trinity. The colors were chosen for their revolutionary meaning: white represents the desire to form a peaceful nation, discarding all colonial institutions, and red the flame of liberty or the blood of the revolutionary martyrs such as Tiradentes. In spite of not being the largest state of Brazil and ranking second in population, Minas Gerais has the largest number of cities. Of the more than 5,500 municipalities in the country, Minas has 853 of them, a fact explained by the number of inhabitants and by the vast territory, comparable in area to Madagascar and larger than Metropolitan France. The most notable cities are: the capital Belo Horizonte, Contagem, Betim, Juiz de Fora, Varginha, Muriae, Montes Claros, Uberlândia, Governador Valadares, Ipatinga, Ouro Preto, Sete Lagoas, Uberaba, Araxá, Patos de Minas, Divinópolis, Barbacena, Pouso Alegre, Janaúba, Teófilo Otoni, Conselheiro Lafaiete, Mariana, Poços de Caldas and São João del Rei. ^ The presented pronunciation is in Brazilian Portuguese. The Iberian Portuguese pronunciation is [ˈminɐʒ ʒɨˈɾajʃ]. ^ "Instituto Brasileiro de Geografia e Estatística". IBGE. 2012-08-31. Retrieved 2013-06-08. ^ "Minas Gerais". IBGE. IBGE. Retrieved 16 January 2016. ^ "Sala de imprensa | notícias | IBGE divulga as estimativas populacionais dos municípios em 2012". IBGE. Retrieved 2013-06-08. ^ Gabriel Maia; Gabriel Zanlorenssi; Rodolfo Almeida (28 February 2018). "Os presidentes do Brasil: mandato, formação, cidade e idade". Nexo Jornal. Retrieved 11 June 2018. ^ "Existem Montanhas Em Minas Gerais" (PDF) (in Portuguese). Federal University of Viçosa. ^ Arem, Joel Beryl Gemology Information Retrieved December 30, 2014. ^ "Sistema IBGE de Recuperação Automática - SIDRA". Sidra.ibge.gov.br. Retrieved 2013-06-08. ^ a b "Sistema IBGE de Recuperação Automática - SIDRA". Sidra.ibge.gov.br. Archived from the original on 2012-08-05. Retrieved 2013-06-08. ^ a b c d e f g h Júnia Ferreira Furtado (2009). Chica da Silva e o Contratador de Diamantes- o Outro Lado do Mito. Companhia das Letras. p. 403. ^ a b c "Domínio Público — Pesquisa Básica" (PDF). Dominiopublico.gov.br. Retrieved 2013-06-08. ^ "Admixture in White Brazilians". Scielo.br. Retrieved 2013-06-08. ^ Lins, TC; Vieira, RG; Abreu, BS; Grattapaglia, D; Pereira, RW (2009-07-28). "Genetic composition of Brazilian population samples based on a set of twenty-eight ancestry informative SNPs". Am. J. Hum. Biol. 22 (2): 187–92. doi:10.1002/ajhb.20976. PMID 19639555. ^ "Brasil 500 anos". Ibge.gov.br. Archived from the original on 2013-05-08. Retrieved 2013-06-08. ^ Exports of Minas Gerais (2012). DataViva. Retrieved on 01/10/14. ^ Agrogemeos. "Governador Valadares MG Mapa e Imagens". 18.8635692596,-41.9568710327: Agrogemeos.com.br. Retrieved 2013-06-08. ^ "DDD das cidades de Minas Gerais (MG)" (in Portuguese). Códigos DDD. Retrieved 12 August 2016. ^ "Soccer Hall - Love for Soccer". Archived from the original on 2010-07-15. Retrieved 2006-09-14. Wikivoyage has a travel guide for Minas Gerais. Wikimedia Commons has media related to Minas Gerais.